The Dow Jones Industrial Average (DJIA) fell today – down triple digits most of the day – after slipping 253 points Thursday. That erases all gains from the short-lived "Yellen rally" – when the market climbed 224 points Wednesday after the U.S. Federal Reserve announced a 0.25% rate hike. "The market's saying 'reality always trumps hype,'" said Money Morning Capital Wave Strategist Shah Gilani. "We knew that underneath the latest push higher, most stocks were coming unglued. 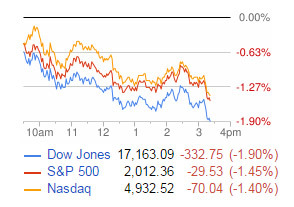 The reality is stocks are vulnerable to a correction starting now." Besides the Dow, oil also plunged today. Oil prices fell for the third straight session today as the market reels from Wednesday's bearish EIA supply report and a rising U.S. dollar due to the Fed rate hike. WTI crude oil prices dropped 0.9% to $34.65 per barrel for a weekly loss of 2.7%. Meanwhile, Brent crude oil – the global benchmark priced in London – tumbled 1.1% to $37.22 per barrel, losing 4.6% for the week. So what can we expect from the Dow Jones Industrial Average next week? Gilani says next week could be a struggle after the sell-off that Thursday and Friday delivered. The Dow's biggest losers today included Walt Disney Co. (NYSE: DIS), Boeing Co. (NYSE: BA), and Goldman Sachs Group Inc. (NYSE: GS), all down 3% to 4%. Buzz points to Amazon.com (Nasdaq: AMZN) and Alphabet Inc. (Nasdaq: GOOG, GOOGL) as possible future Dow additions. Supporters say these stocks would make the Dow more reflective of the economy, like when Apple Inc. (Nasdaq: AAPL) was added earlier this year. But in order for these pricey stocks – AMZN trading at $668 and GOOGL around $760 – to join the Dow 30, they'd have to hold stock splits to bring down their price per share – just like Apple did. Other big moves in the stock market today came from BlackBerry Ltd. (Nasdaq: BBRY), up 12% in afternoon trading. BlackBerry came out with third-quarter earnings Friday morning that showed a slimmer loss than expected – $0.03 per share, compared to the expected $0.14 per share. Darden Restaurants Inc. (NYSE: DRI) was up 7.5% just after 3 p.m. The restaurant chain owners reported today that sales were up 1% last quarter and profit up 12%. Disney stock was down 3% by 3 p.m. on Disney's big Star Wars premiere day. Despite today's loss, DIS stock is up 15% this year, and we see more gains ahead in 2016 – here's our latest Disney stock price analysis.